Thanks to Lowe’s Home Improvement for underwriting this post because…. Ladies, it’s spring, and you know what that means – garden time!! But… it’s also t-ball, tumbling, and Crossfit time. Not to mention, we’re still in the thick of school work. If that intro made you feel just a little bit discouraged that, once again, your garden was going to fall to the back burner this year, then this tutorial is for you. See, I’m right there with you. We’re renovating our new house, and homeschooling on top of feeding, clothing, and breaking up fights between kids. And did I mention I’m making my niece’s wedding cake this week? Yikes! But I was feeling pretty discouraged about gardening this year too – even though I want to grow my own food so bad! Then I came across this thing called “self-watering”, or sub-irrigated garden beds. It’s the idea that you make a raised bed, or garden container, put a “bladder” in the bottom to hold water, and that water slowly seeps up into the dirt to keep your plants watered. That way they don’t die in this southern heat, even though you don’t have time to tend them every day. So brilliant! 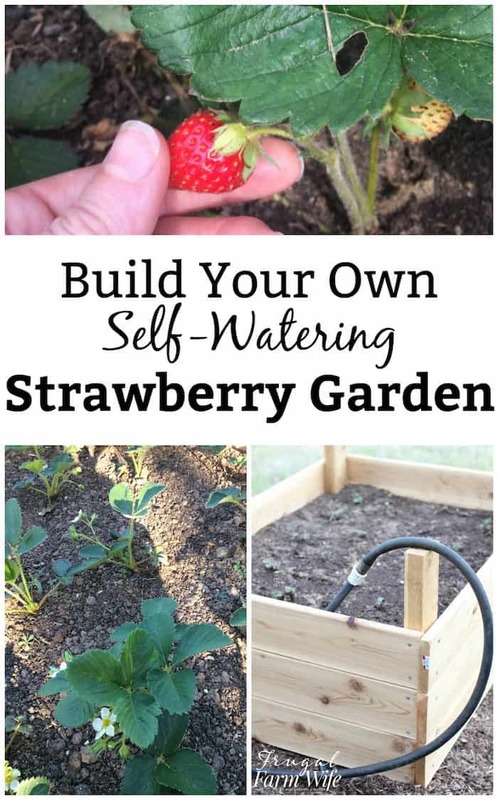 This is perfect for growing strawberries, which are a multi-year plant, and a great way to make the most out of a small yard – because you can grow a lot in these little garden beds! 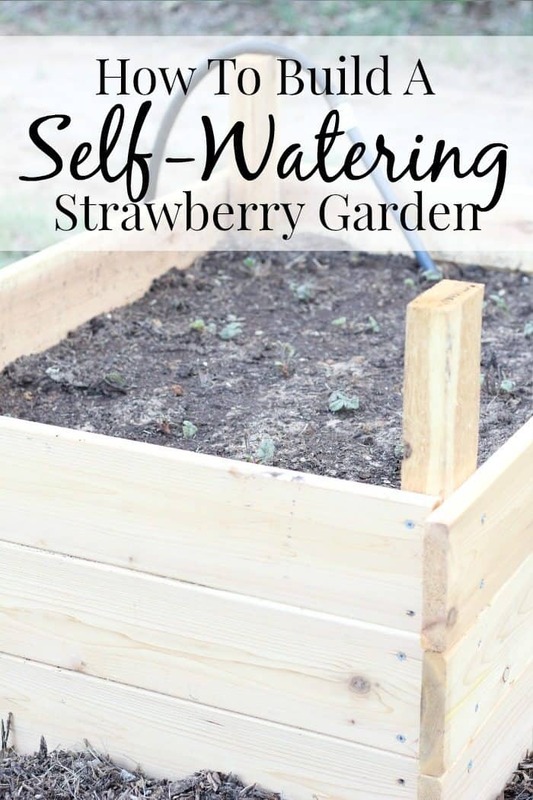 Take an afternoon off, go to Lowe’s for supplies, and make and plant a few of these raised beds, then all you need is to come back every few days to turn on the water. We’re planning to fill this whole area with wood chips that the city kindly dumped in our yard when they were clearing trees around electric lines, and then putting sub-irrigated garden beds on top to create a kind of gardening oasis. I’m not much of a carpenter, so I went to Lowe’s picked out my lumber, and handed my set of measurements to one of the customer service reps, so he could cut it for me. It was nice not having to set up the saw at home, but the main reason I did it was so that it would all fit in my car – no way I can fit eight-foot-long boards in my trunk! Dirt – We used a combination of compost, and top soil from the pigs rooting area, but you can also get this at Lowe’s. Strawberry Plants – Lowes sells these in 6-packs. You can also find the bare-root variety that I show in the video indoors in the garden section. I am not a carpenter. At all. And I was a little bit intimidated about taking this project on by myself since Gabe is usually the one who does the heavy lifting (so to speak) on outdoor projects – and he did help by bringing the wood chips up and filling the bed with dirt – but he’s been so swamped with business lately that I was largely on my own with these garden beds. But it turned out to be pretty easy – even for me! the hardest part was getting started, because I felt so out of my depth. As you can see in the video, it was just a series of drilling holes and screwing screws. No biggie. Start with the short end of the bed. Drill pilot holes through the 1x6s into the 2×4 to avoid cracking when you screw (I broke my drill bit half way through the project, and finished without it. The boards cracked a little bit, but it wasn’t terrible). 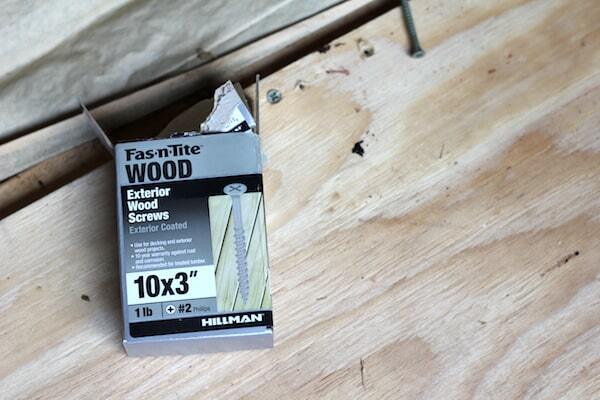 Screw your decking screws into the pilot holes, being sure to keep the edges flush. Repeat with the next two boards. Repeat the whole process with the other end. Stand both ends up on their sides, and fit one of your 48 inch lengths of 1×6 onto the top, aligned with what will be the bottom board on the short side. Again, be sure to keep the edges of your 1×6 flush with the edges of your bed sides. Repeat the pilot hole and screwing process. Flip bed over, and repeat on the other side. When I flipped mine over, I was a little panicked at first, because I wasn’t able to get both sides flush with the outside boards. I hadn’t been able to keep things square on the other side! It wasn’t a big deal though. I pulled the sides out the best I could, and screwed things in place. One end hangs over the side by a fraction of an inch. Don’t worry if your bed isn’t perfect! It will still work just fine! This is a lot easier in an outdoor bed than in a true container garden, because there’s no need to drill excess water drainage holes – the extra water will just seep into the ground! Snake it out in the bottom of your bed, and flush the ends agains the side of your bed. Cut or dill a 3/4 inch hole in one of the elbows of the pipe against the garden bed. Force your riser into the hole. 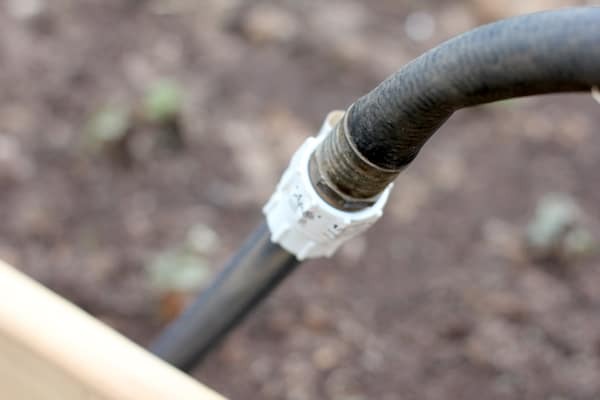 Screw the drip irrigation female-to-female adapter to the top. Fill the bed with dirt, being careful to keep the riser in its place. Plant your plants or seeds, and water well from both top and bottom. You should only need to water from the bottom after the initial watering in of the plants or seeds. Watch the video above for details on the strawberry planting process. And if I can do it, anybody can do it. Anybody. Hi, can you please explain who this perforated drainage pipe works. Is it closed at both ends so the water cannot run out?